Because of limitations in planning tools, finance teams compromise between getting the plan right and just getting it done. Excel is NOT a business management application. It is a personal productivity tool. Excel was never designed to provide a collaborative system for financial management. The many issues arising from Excel’s use include errors, lack of control, lack of security, lack of expertise, poor value and wasted organization time. Organizations today use consistent systems to manage Sales (CRM), Human Resource (HRMS), Invoicing (SOP/AR), Inventory (MRP, Demand Management), Expense (Purchasing, Expense Control, AP) and Transactions/Actual (GL). Arguably planning the future is the most important task of management. Yet, despite the acceptance of the need for systems elsewhere, the organization is comfortable managing the mission critical (“how will we manage and measure our business performance”) budgeting and forecasting process using Excel. Excel is managed by Finance which lacks the training and skills to design, develop and maintain an organization wide system. HM Customs & Excise describes the Excel risk as: “They are often designed and developed by employees who are rarely qualified to do so and are seldom checked to make sure they do what was actually intended, not realizing that creating a spreadsheet is akin to programming and the untested spreadsheet is as dangerous and untrustworthy as an untested program”. The process is simply broken. In summary, using Excel causes significant issues to the organization and denies the organization a collaborative, connected and productive planning process. The impact is under appreciated and under estimated. Organizations continue to operate “in denial” refusing to attempt to improve the process and preferring to remain with spreadsheets, dismissing obvious benefits documented in case studies. A better tool calls for a better process. We guide you out of common pitfalls so you can deliver on-time and on-budget. Time invested in individually copying and maintaining spreadsheets for business units, profit and cost centers are removed. Template creation, maintenance and replication will now be automatic. Your performance information is stored in a database – there is no longer a need for spreadsheets to be created for alternative views/reports, additional scenario analysis, storage of history or planning iterations. Aggregation, including allocation routines, transfers, consolidations and other roll-ups occurs automatically. Spreadsheets that were created and maintained to link and consolidate sub-spreadsheets are now irrelevant. There is no wait for the results. All users now use their web-based template for access. Purpose built workflow controls interaction and progress through each planning cycle. There is no need for emailing spreadsheets, manual logging of progress. Concerns regarding “which spreadsheet is right?” are removed. The use of Adaptive Planning removes the need for reconciling spreadsheet links and internal formulae as you change. Administration of the process, security and business rules are centralized. The complexity of spreadsheets often prevents audit and validation of assumptions, inputs, calculations and outputs. Over 92% of spreadsheets have calculation errors (source: KPMG) and this risk is removed. Spreadsheets have no inherent or centrally maintained security. Proprietary and valuable business planning and performance management information is unprotected in this environment. Adaptive Planning is completely secure. Use of a purpose built planning application builds confidence in the quality and accuracy of the data presented. Unlike spreadsheets, there is “one place” for all financial and operational planning and performance information. The systematic approach where the existing manual processes are replacedallows greater participation and/or frequency. This may mean planning can be extended to more users deeper into the company. It may mean greater participation during the planning iterations (initial submission, fine tuning, agreement cycles). You can also now increase the frequency of planning (rolling monthly updated, “on demand” or event based forecasting, etc.). A systematic approach with participation by the business managers drives accountability into the business. Business operations and planning processes require great flexibility to adapt to new circumstances and demands and provide what if? modeling. Changing processes, data views, metrics or assumptions quickly and without disrupting existing data or the business users is an integral part of Adaptive Planning. You can now conduct multi-version planning for different business conditions in one integrated system. Adaptive Planning integrates data with your other systems using an easy to manage and reliable process. The users are managed via their web browser to ease the distribution and data collection and reporting processes. There is less network traffic and overhead. Increase Finance’s time for analytical tasks, supporting the business operations and examining opportunities for increasing revenues, cost efficiencies and continued process improvement. Adaptive has examples of customers who, through us of Adaptive Planning, were able to dedicate finance and business time to analysis resulting in substantial savings. Typical areas such as product and customer profitability, marketing spend effectiveness, standardization and control of capital and operating expenses, increased scrutiny and business case demands for justification of new projects. Executive and Business Managers increase productive time on planning and performance discussion, preparation, review and agreement versus the actual planning process itself. Time can be reallocated to other business management tasks. Businesses are multi-dimensional with key dimensions of products, customers, personnel, channels all requiring integration for planning and performance measurement. A purpose built system deals with these relationship complexities and planning process demands as standard. Adaptive Planning provides for centralized and controlled assumptions, drivers and KPIs. All planning can be based on using these corporate standards to ensure a consistent approach, the ability to truly measure and compare performance “apples to apples” and also drive out discretionary expenses (such as travel, temporary personnel) with greater detail and control. Best Practice systems and methodology approach drives considerable benefit through accountability, participation and increasing manager’s responsibility for performance. Manage and measure business performance on driver basis, KPIs, impact points and focus attention to mission critical data while avoiding information overload. Decision-making is based on proven, accurate and valid planning data. Use of enhanced systems and increased in time to “value add” activity improves morale, drives a performance based culture and ensures all management is driving towards same business goals and objectives. Focus expensive resources upon performance prediction and analysis versus mechanics and data integrity resolution. Investment in technology and enhanced productivity versus increased labor costs. 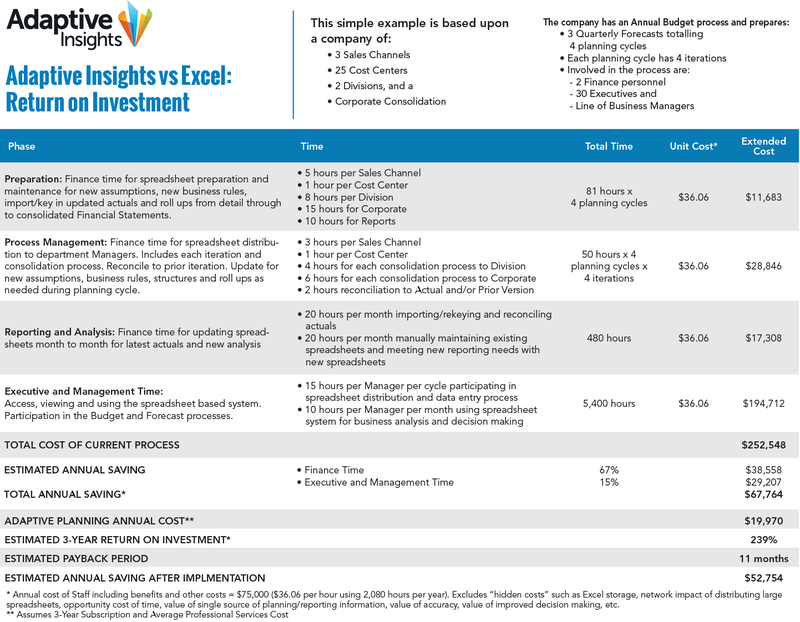 Adaptive Planning leverages existing Excel, GL, other systems and your financial expertise to promote adoption. Drive corporate strategy down within the Adaptive Planning system for guidance, validation and control purposes. Improve planning cycle times (months to weeks, weeks to days, plan recomputation/realignment within hours). Having one single integrated system for all performance planning? Identifying a revenue or cost trend and acting to exploit that opportunity or prevent a continuation ofinefficiency? Being able to plan continuously and in real time through the planning cycle? Having increased accountability and management responsibility throughout the organization? Excel, combined with Finance and Management attitude, is the inhibitor to an organization developing an effective and valuable planning process. The option to “do nothing” is the most common choice despite acceptance of the need to change. Despite the potential value and operational benefits organizations will cite the cost of change as a reason to remain with Excel. Spreadsheets are so inefficient and costly to maintain it is easy to estimate the financial benefit of replacing Excel as a system without needing to include any “soft” benefits.